I’m a part of several relaxed hair communities on Facebook where women share their tips about caring for their relaxed hair and can also ask questions about issues or concerns they have. One of the most common issues that seem to pop up is problems with hair shedding. What I’ve found though as I read through the comments and see the exchanges between the original poster and the responders is that the issue isn’t always shedding like the original poster said it’s breakage. Hair shedding and hair breakage both cause us to lose hair but they aren’t the same though they tend to be confused quite often. They have different causes, different results and different ways to manage and reverse them. So it’s important to understand which one you’re experiencing so that you can properly address it. What’s the difference between shedding and breaking hair? hen you’re experiencing one or the other it probably doesn’t seem that important which is which because you’re losing hair and want it to stop. But as I alluded to it is really important. Both have different causes and different ways to attack the issue. Ok. here’s how to tell which one you’re experiencing. Take a look at the hair leaving your head. If it’s the length of your hair, and you see a tiny white bulbous thing on the end your hair is shedding. That white bulb is essentially the root of the hair strand so the whole strand has come out hence the hair is shedding. If you’re seeing hair shorter than the length of your hair strands its breakage. Hair breakage can happen at any point of your hair strand. In my experience with relaxed hair, the ends and line of demarcation (where relaxed and natural hair meet) are the places that tend to break the most. So ends don’t shed. They break. What causes shedding and breakage? Now shedding isn’t always a cause for concern because we can normally shed anywhere from 50-200 strands of hair a day. It’s just a normal part of being alive. 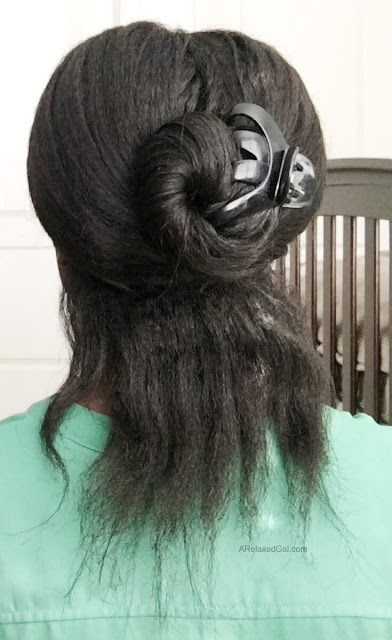 When shedding does become an issue when you’re shedding more than you typically do and/or the hair is coming out in clumps creating bare spots on your scalp. This is usually called excessive shedding and can be caused by any number of things such as a change in diet, medication, allergies, stress. When your hair is breaking there isn’t much of a normal state. Admittedly I don’t see a few strands breaking here and there as a major cause for concern though they should be addressed. Hair breaks mainly due to how it’s treated and when it’s in a weakened state. What can be done to minimize or stop breakage and shedding? Truth bomb here. You’re never going to completely and forever eliminate one or both but you can minimize breakage and shedding and even stop them for a while. Here are some things you can do. To minimize your hair shedding there aren’t a lot of simple remedies because a lot of what causes excessive shedding is internal. So consulting with a medical professional is your best option if you’re seeing a lot of hair coming out of your head. If you’re experiencing slightly more shedding than normal doing things like hair rinses with green tea, black tea, or coffee have been said to help. Additionally, doing things like rubbing your scalp with garlic or using garlic shampoos have been effective for some. So now that you know more about hair breakage and hair shedding would you be able to tell them apart if one of them was happening to your hair?